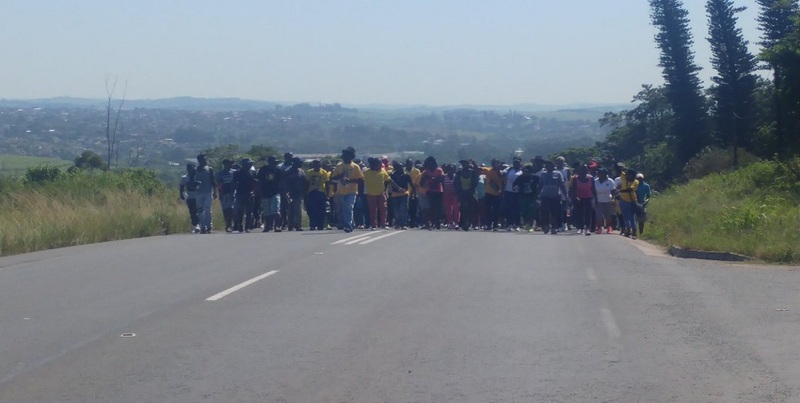 The ANC Youth League (ANCYL) was joined by hundreds of protesters on Thursday in a march ending at the new Ballito Junction Regional Mall in demand of jobs for the youth.Â The march was supposed to be peaceful, but altercations broke out between protesters, journalists, and the police. The march was led by KwaZulu-Natalâ€™s Youth League secretary, Thanduxolo Sabelo, in what was called a â€œRadical Economic Freedom Marchâ€. The League said it represented the regionâ€™s youth and demanded jobs from the mallâ€™s developers. The ANCYL handed a memorandum to the developers. Sabelo told The Daily Vox that the march had a clear purpose. â€œWe are calling on all developers to include young and local people in the economy and share the spoils of the economy. We are calling on them to create jobs for locals and young people in particularly. More importantly we are calling for them to give 51% of the shares to locals,â€ he said. Sabelo stressed the importance of local beneficiation, saying that the land the mall was built on belonged to the people as a whole. #BallitoJunction findings of the #ANCYL is that 80 % of people which have been employed at the new mall are not from Kwa Dukuza. Protesters set a sugarcane field alight near a wedding venue on the approach to Umhlali Country Club on the way to the mall. Sabelo said they had not identified the culprits and condemned the act. There were also reports that protesters hurled stones at mall employees, and threatened journalists who were taking photos of them. Sabelo told The Daily Vox the march was â€œvery peaceful” apart from a few incidents when the police tried to prevent the crowds from entering the mall, which he said had already been agreed upon. Scuffles also broke out between police and protesters and protesters threw stones when police prevented them from entering the mall. After some negotiation between the ANCYL and police, protesters were able to enter the mall. The police, security and traffic officials were present in their numbers on the sides of the roads and roads leading to the mall had been closed due to the traffic. Sabelo said that close to 20 000 young people joined the march. However, Umhlali SAPS spokesperson warrant officer Vinny Pillay projected the numbers much lower. How do you take such a comment seriously? And the ANCYL wonders why it’s no longer relevant in today’s political space.